We would like to assure you that any funkiness you notice on our blog in the near future is not accidental. Baron de Bubba has arrived in town, with a mission to lay the funky grooves down. Word to ya mutha. Okay, that last part was added by Princess Nobody (our editor), but we presume that you already knew that. The quintessential New Yorker, George Carlin, passed away on Sunday at the age of 71. Always one to tell it like he saw it, Carlin made judicial history in the 1970's after he was arrested for the above act. A NYC radio station later aired the Seven Dirty Words You Can't Say on Television and the Supreme Court of the United States set the standards for decency on the airwaves based on a complaint from an outraged listener. The seven words we'd use to describe George Carlin are: hilarious, brilliant, kind, moral, aware, influential and unforgettable. Rest in peace, Mr. Carlin. Forgive us, loyal readers, we have been on the Cape and in vacation mode as of late, so the big news has fallen by the wayside. Jamie Lynn Spears gave birth to a baby girl, Maddie, in Louisiana on Thursday. Best wishes to the now 17-year-old. If her daughter is half as sweet as our Royal Puppy, Maddie, then the world is a much better place. We imagine Jamie Lynn's daughter will not incessantly lick everything in sight as our little princess does (top photo) and if she does, then we blame inbreeding. That was a joke, but not really. Auntie Brit Brit was present for Maddie's arrival after the court allowed her father to put her Studio City, CA house on the market. The listing price is $10 plus million. Oh, and that photo of Brit is from when she was spending time on Mel Gibson's island. What a lovely neighbor he is to reach out to our troubled young gal. Mazel Tov, Jamie Lynn. How much cold could a coldplay play, if a coldplay could play cold? Happy heat wave. We love this song, "I'm Yours," by Jason Mraz. Enjoy. Duffy is our new favorite Brit. Think Winehouse sans the wine. 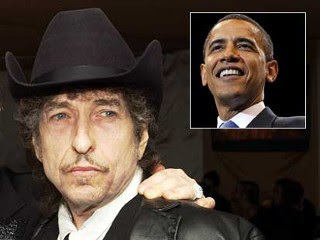 For the first time ever, Bob Dylan has publicly endorsed a politician. Dylan told The Times of London, "Well, you know right now America is in a state of upheaval. Poverty is demoralizing. You can't expect people to have the virtue of purity when they are poor. But we've got this guy out there now who is redefining the nature of politics from the ground up — Barack Obama. He's redefining what a politician is, so we'll have to see how things play out. Am I hopeful? Yes, I'm hopeful that things might change. Some things are going to have to." Following the interview, Dylan shook hands with the reporter and as he walked out, turned and said, "You should always take the best from the past, leave the worst back there and go forward into the future." When you ain't got nothin', you got nothin' to lose. Enjoy. Our favorite singer of all time, Elza, rocks it out live at the Bitter End in NYC in the above clip. In recent Elza news, she just had identical twin girls, Savannah and Ashley (named after rivers in South Carolina where Elza grew up). The ABC documentary entitled, Hopkins, will feature several of Elza's songs so definitely tune in. A preview commercial for the film debuted during the Grey's Anatomy finale 2 weeks ago. While we never developed a love for Grey's due to our relationship with the Sopranos...we're all about loving Elza. She's our new Amy Winehouse. Plus our boy, Ben, attends Johns Hopkins. Six degrees, yo.